The Star-Spectroscope of the Lick Observatory in 1898. Designed by James Keeler and constructed by John Brashear. Astronomical spectroscopy is the study of astronomy using the techniques of spectroscopy to measure the spectrum of electromagnetic radiation, including visible light and radio, which radiates from stars and other celestial objects. A stellar spectrum can reveal many properties of stars, such as their chemical composition, temperature, density, mass, distance, luminosity, and relative motion using Doppler shift measurements. Spectroscopy is also used to study the physical properties of many other types of celestial objects such as planets, nebulae, galaxies, and active galactic nuclei. Astronomical spectroscopy is used to measure three major bands of radiation: visible spectrum, radio, and X-ray. While all spectroscopy looks at specific areas of the spectrum, different methods are required to acquire the signal depending on the frequency. Ozone (O3) and molecular oxygen (O2) absorb light with wavelengths under 300 nm, meaning that X-ray and ultraviolet spectroscopy require the use of a satellite telescope or rocket mounted detectors. :27 Radio signals have much longer wavelengths than optical signals, and require the use of antennas or radio dishes. Infrared light is absorbed by atmospheric water and carbon dioxide, so while the equipment is similar to that used in optical spectroscopy, satellites are required to record much of the infrared spectrum. Incident light reflects at the same angle (black lines), but a small portion of the light is refracted as coloured light (red and blue lines). The resolution of a prism is limited by its size; a larger prism will provide a more detailed spectrum, but the increase in mass makes it unsuitable for highly detailed work. This issue was resolved in the early 1900s with the development of high-quality reflection gratings by J.S. Plaskett at the Dominion Observatory in Ottawa, Canada. :11 Light striking a mirror will reflect at the same angle, however a small portion of the light will be refracted at a different angle; this is dependent upon the indices of refraction of the materials and the wavelength of the light. By creating a "blazed" grating which utilizes a large number of parallel mirrors, the small portion of light can be focused and visualized. These new spectroscopes were more detailed than a prism, required less light, and could be focused on a specific region of the spectrum by tilting the grating. The limitation to a blazed grating is the width of the mirrors, which can only be ground a finite amount before focus is lost; the maximum is around 1000 lines/mm. In order to overcome this limitation holographic gratings were developed. Volume phase holographic gratings use a thin film of dichromated gelatin on a glass surface, which is subsequently exposed to a wave pattern created by an interferometer. This wave pattern sets up a reflection pattern similar to the blazed gratings but utilizing Bragg diffraction, a process where the angle of reflection is dependent on the arrangement of the atoms in the gelatin. The holographic gratings can have up to 6000 lines/mm and can be up to twice as efficient in collecting light as blazed gratings. Because they are sealed between two sheets of glass, the holographic gratings are very versatile, potentially lasting decades before needing replacement. Light dispersed by the grating or prism in a spectrograph can be recorded by a detector. Historically, photographic plates were widely used to record spectra until electronic detectors were developed, and today optical spectrographs most often employ charge-coupled devices (CCDs). The wavelength scale of a spectrum can be calibrated by observing the spectrum of emission lines of known wavelength from a gas-discharge lamp. 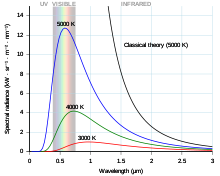 The flux scale of a spectrum can be calibrated as a function of wavelength by comparison with an observation of a standard star with corrections for atmospheric absorption of light; this is known as spectrophotometry. Radio astronomy was founded with the work of Karl Jansky in the early 1930s, while working for Bell Labs. He built a radio antenna to look at potential sources of interference for transatlantic radio transmissions. One of the sources of noise discovered came not from Earth, but from the center of the Milky Way, in the constellation Sagittarius. In 1942, JS Hey captured the sun's radio frequency using military radar receivers. :26 Radio spectroscopy started with the discovery of the 21-centimeter H I line in 1951. Radio interferometry was pioneered in 1946, when Joseph Lade Pawsey, Ruby Payne-Scott and Lindsay McCready used a single antenna atop a sea cliff to observe 200 MHz solar radiation. Two incident beams, one directly from the sun and the other reflected from the sea surface, generated the necessary interference. The first multi-receiver interferometer was built in the same year by Martin Ryle and Vonberg. In 1960, Ryle and Antony Hewish published the technique of aperture synthesis to analyze interferometer data. The aperture synthesis process, which involves autocorrelating and discrete Fourier transforming the incoming signal, recovers both the spatial and frequency variation in flux. The result is a 3D image whose third axis is frequency. For this work, Ryle and Hewish were jointly awarded the 1974 Nobel Prize in Physics. Newton used a prism to split white light into a spectrum of color, and Fraunhofer's high-quality prisms allowed scientists to see dark lines of an unknown origin. In the 1850s, Gustav Kirchhoff and Robert Bunsen described the phenomena behind these dark lines. Hot solid objects produce light with a continuous spectrum, hot gases emit light at specific wavelengths, and hot solid objects surrounded by cooler gases show a near-continuous spectrum with dark lines corresponding to the emission lines of the gases. :42–44 By comparing the absorption lines of the sun with emission spectra of known gases, the chemical composition of stars can be determined. The major Fraunhofer lines, and the elements with which they are associated, appear in the following table. Designations from the early Balmer Series are shown in parentheses. Not all of the elements in the sun were immediately identified. Two examples are listed below. By analyzing the width of each spectral line in an emission spectrum, both the elements present in a star and their relative abundances can be determined. Using this information stars can be categorized into stellar populations; Population I stars are the youngest stars and have the highest metal content (our Sun is a Pop I star), while Population III stars are the oldest stars with a very low metal content. Black body curves for various temperatures. In 1860 Gustav Kirchhoff proposed the idea of a black body, a material that emits electromagnetic radiation at all wavelengths. In 1894 Wilhelm Wien derived an expression relating the temperature (T) of a black body to its peak emission wavelength (λmax). b is a constant of proportionality called Wien's displacement constant, equal to 6997289777290000000♠2.8977729(17)×10−3 m⋅K. This equation is called Wien's Law. By measuring the peak wavelength of a star, the surface temperature can be determined. For example, if the peak wavelength of a star is 502 nm the corresponding temperature will be 5778 kelvins. where R is the radius of the star and σ is the Stefan–Boltzmann constant, with a value of 6992567036700000000♠5.670367(13)×10−8 W⋅m−2⋅K−4. Thus, when both luminosity and temperature are known (via direct measurement and calculation) the radius of a star can be determined. The spectra of galaxies look similar to stellar spectra, as they consist of the combined light of millions of stars. Doppler shift studies of galaxy clusters by Fritz Zwicky in 1937 found that most galaxies were moving much faster than seemed to be possible from what was known about the mass of the cluster. Zwicky hypothesized that there must be a great deal of non-luminous matter in the galaxy clusters, which became known as dark matter. Since his discovery, astronomers have determined that a large portion of galaxies (and most of the universe) is made up of dark matter. In 2003, however, four galaxies (NGC 821, NGC 3379, NGC 4494, and NGC 4697) were found to have little to no dark matter influencing the motion of the stars contained within them; the reason behind the lack of dark matter is unknown. In the 1950s, strong radio sources were found to be associated with very dim, very red objects. When the first spectrum of one of these objects was taken there were absorption lines at wavelengths where none were expected. It was soon realised that what was observed was a normal galactic spectrum, but highly red shifted. These were named quasi-stellar radio sources, or quasars, by Hong-Yee Chiu in 1964. Quasars are now thought to be galaxies formed in the early years of our universe, with their extreme energy output powered by super-massive black holes. The properties of a galaxy can also be determined by analyzing the stars found within them. NGC 4550, a galaxy in the Virgo Cluster, has a large portion of its stars rotating in the opposite direction as the other portion. It is believed that the galaxy is the combination of two smaller galaxies that were rotating in opposite directions to each other. Bright stars in galaxies can also help determine the distance to a galaxy, which may be a more accurate method than parallax or standard candles. The interstellar medium is matter that occupies the space between star systems in a galaxy. 99% of this matter is gaseous - hydrogen, helium, and smaller quantities of other ionized elements such as oxygen. The other 1% is dust particles, thought to be mainly graphite, silicates, and ices. Clouds of the dust and gas are referred to as nebulae. There are three main types of nebula: absorption, reflection, and emission nebulae. Absorption (or dark) nebulae are made of dust and gas in such quantities that they obscure the starlight behind them, making photometry difficult. Reflection nebulae, as their name suggest, reflect the light of nearby stars. Their spectra are the same as the stars surrounding them, though the light is bluer; shorter wavelengths scatter better than longer wavelengths. Emission nebulae emit light at specific wavelengths depending on their chemical composition. In the early years of astronomical spectroscopy, scientists were puzzled by the spectrum of gaseous nebulae. In 1864 William Huggins noticed that many nebulae showed only emission lines rather than a full spectrum like stars. From the work of Kirchhoff, he concluded that nebulae must contain "enormous masses of luminous gas or vapour." However, there were several emission lines that could not be linked to any terrestrial element, brightest among them lines at 495.9 nm and 500.7 nm. These lines were attributed to a new element, nebulium, until Ira Bowen determined in 1927 that the emission lines were from highly ionised oxygen (O+2). These emission lines could not be replicated in a laboratory because they are forbidden lines; the low density of a nebula (one atom per cubic centimetre) allows for metastable ions to decay via forbidden line emission rather than collisions with other atoms. Using this information the shape of the Milky Way has been determined to be a spiral galaxy, though the exact number and position of the spiral arms is the subject of ongoing research. Dust and molecules in the interstellar medium not only obscures photometry, but also causes absorption lines in spectroscopy. Their spectral features are generated by transitions of component electrons between different energy levels, or by rotational or vibrational spectra. Detection usually occurs in radio, microwave, or infrared portions of the spectrum. The chemical reactions that form these molecules can happen in cold, diffuse clouds or in the hot ejecta around a white dwarf star from a nova or supernova. Polycyclic aromatic hydrocarbons such as acetylene (C2H2) generally group together to form graphites or other sooty material, but other organic molecules such as acetone ((CH3)2CO) and buckminsterfullerenes (C60 and C70) have been discovered. Stars and interstellar gas are bound by gravity to form galaxies, and groups of galaxies can be bound by gravity in galaxy clusters. With the exception of stars in the Milky Way and the galaxies in the Local Group, almost all galaxies are moving away from us due to the expansion of the universe. is the distance from Earth.
. The larger the value of z, the more redshifted the light and the farther away the object is from the Earth. As of January 2013, the largest galaxy redshift of z~12 was found using the Hubble Ultra-Deep Field, corresponding to an age of over 13 billion years (the universe is approximately 13.82 billion years old). , where c is the speed of light. This motion can cause confusion when looking at a solar or galactic spectrum, because the expected redshift based on the simple Hubble law will be obscured by the peculiar motion. For example, the shape and size of the Virgo Cluster has been a matter of great scientific scrutiny due to the very large peculiar velocities of the galaxies in the cluster. Two stars of different size orbiting the center of mass. The spectrum can be seen to split depending on the position and velocity of the stars. Just as planets can be gravitationally bound to stars, pairs of stars can orbit each other. Some binary stars are visual binaries, meaning they can be observed orbiting each other through a telescope. Some binary stars, however, are too close together to be resolved. These two stars, when viewed through a spectrometer, will show a composite spectrum: the spectrum of each star will be added together. This composite spectrum becomes easier to detect when the stars are of similar luminosity and of different spectral class. Spectroscopic binaries can be also detected due to their radial velocity; as they orbit around each other one star may be moving towards the Earth whilst the other moves away, causing a Doppler shift in the composite spectrum. The orbital plane of the system determines the magnitude of the observed shift: if the observer is looking perpendicular to the orbital plane there will be no observed radial velocity. For example, if you look at a carousel from the side, you will see the animals moving toward and away from you, whereas if you look from directly above they will only be moving in the horizontal plane. Planets, asteroids, and comets all reflect light from their parent stars and emit their own light. For cooler objects, including solar-system planets and asteroids, most of the emission is at infrared wavelengths we cannot see, but that are routinely measured with spectrometers. For objects surrounded by gas, such as comets and planets with atmospheres, further emission and absorption happens at specific wavelengths in the gas, imprinting the spectrum of the gas on that of the solid object. In the case of worlds with thick atmospheres or complete cloud cover (such as the gas giants, Venus, and Saturn's satellite Titan (moon)), the spectrum is mostly or completely due to the atmosphere alone. The reflected light of a planet contains absorption bands due to minerals in the rocks present for rocky bodies, or due to the elements and molecules present in the atmosphere. To date over 3,500 exoplanets have been discovered. These include so-called Hot Jupiters, as well as Earth-like planets. Using spectroscopy, compounds such as alkali metals, water vapor, carbon monoxide, carbon dioxide, and methane have all been discovered. Asteroids can be classified into three major types according to their spectra. The original categories were created by Clark R. Chapman, David Morrison, and Ben Zellner in 1975, and further expanded by David J. Tholen in 1984. In what is now known as the Tholen classification, the C-types are made of carbonaceous material, S-types consist mainly of silicates, and X-types are 'metallic'. There are other classifications for unusual asteroids. C- and S-type asteroids are the most common asteroids. In 2002 the Tholen classification was further "evolved" into the SMASS classification, expanding the number of categories from 14 to 26 to account for more precise spectroscopic analysis of the asteroids. Optical spectrum of Comet Hyakutake. The spectra of comets consist of a reflected solar spectrum from the dusty clouds surrounding the comet, as well as emission lines from gaseous atoms and molecules excited to fluorescence by sunlight and/or chemical reactions. For example, the chemical composition of Comet ISON was determined by spectroscopy due to the prominent emission lines of cyanogen (CN), as well as two- and three-carbon atoms (C2 and C3). Nearby comets can even be seen in X-ray as solar wind ions flying to the coma are neutralized. The cometary X-ray spectra therefore reflect the state of the solar wind rather than that of the comet. ^ a b c d Foukal, Peter V. (2004). Solar Astrophysics. Weinheim: Wiley VCH. p. 69. ISBN 3-527-40374-4. ^ "Cool Cosmos - Infrared Astronomy". California Institute of Technology. Retrieved 23 October 2013. ^ Newton, Isaac (1705). Opticks: Or, A Treatise of the Reflections, Refractions, Inflections and Colours of Light. London: Royal Society. pp. 13–19. ^ Fraunhofer, Joseph (1817). "Bestimmung des Brechungs- und des Farben-Zerstreuungs - Vermögens verschiedener Glasarten, in Bezug auf die Vervollkommnung achromatischer Fernröhre". Annalen der Physik. 56 (7): 282–287. Bibcode:1817AnP....56..264F. doi:10.1002/andp.18170560706. ^ a b c d Hearnshaw, J.B. (1986). The analysis of starlight. Cambridge: Cambridge University Press. ISBN 0-521-39916-5. ^ a b Kitchin, C.R. (1995). Optical Astronomical Spectroscopy. Bristol: Institute of Physics Publishing. pp. 127, 143. ISBN 0-7503-0346-8. ^ a b Ball, David W. (2001). Basics of Spectroscopy. Bellingham, Washington: Society of Photo-Optical Instrumentation Engineers. pp. 24, 28. ISBN 0-8194-4104-X. ^ Barden, S.C.; Arns, J.A. ; Colburn, W.S. (July 1998). d'Odorico, Sandro, ed. "Volume-phase holographic gratings and their potential for astronomical applications". Proc. SPIE. Optical Astronomical Instrumentation. 3355: 866–876. doi:10.1117/12.316806. ^ Oke, J. B.; Gunn, J. E. (1983). "Secondary standard stars for absolute spectrophotometry". The Astrophysical Journal. 266: 713. Bibcode:1983ApJ...266..713O. doi:10.1086/160817. ^ Ghigo, F. "Karl Jansky". National Radio Astronomy Observatory. Associated Universities, Inc. Retrieved 24 October 2013. ^ Pawsey, Joseph; Payne-Scott, Ruby; McCready, Lindsay (1946). "Radio-Frequency Energy from the Sun". Nature. 157 (3980): 158–159. Bibcode:1946Natur.157..158P. doi:10.1038/157158a0. ^ Ryle, M.; Vonberg, D. D. (1946). "Solar Radiation on 175 Mc./s". Nature. 158 (4010): 339–340. Bibcode:1946Natur.158..339R. doi:10.1038/158339b0. ^ Robertson, Peter (1992). Beyond southern skies: radio astronomy and the Parkes telescope. University of Cambridge. pp. 42, 43. ISBN 0-521-41408-3. ^ W. E. Howard. "A Chronological History of Radio Astronomy" (PDF). Archived from the original (PDF) on 2012-07-14. Retrieved 2 December 2013. ^ "How Radio Telescopes Work". Archived from the original on 3 December 2013. Retrieved 2 December 2013. ^ "Press Release: The 1974 Nobel Prize in Physics". Retrieved 2 December 2013. ^ a b Jenkins, Francis A.; Harvey E. White (1957). Fundamentals of Optics (4th ed.). New York: McGraw-Hill. pp. 430–437. ISBN 0-07-085346-0. ^ a b c Morison, Ian (2008). Introduction to Astronomy and Cosmology (PDF). Wiley-Blackwell. p. 61. ISBN 0-470-03333-9. Archived from the original (PDF) on 2013-10-29. ^ G. Kirchhoff (July 1860). "On the relation between the radiating and absorbing powers of different bodies for light and heat". The London, Edinburgh, and Dublin Philosophical Magazine and Journal of Science. Taylor & Francis. 20 (130). ^ Nahar, Anil K. Pradhan, Sultana N. (2010). Atomic astrophysics and spectroscopy. Cambridge: Cambridge University Press. pp. 7, 221. ISBN 978-0-521-82536-8. ^ Mahmoud Massoud (2005). "§2.1 Blackbody radiation". Engineering thermofluids: thermodynamics, fluid mechanics, and heat transfer. Springer. p. 568. ISBN 3-540-22292-8. ^ "Luminosity of Stars". Australia Telescope National Facility. 12 July 2004. Archived from the original on 9 August 2014. Retrieved 2 July 2012. ^ Zwicky, F. (October 1937). "On the Masses of Nebulae and of Clusters of Nebulae". The Astrophysical Journal. 86: 217. Bibcode:1937ApJ....86..217Z. doi:10.1086/143864. ^ Romanowsky, Aaron J.; Douglas, Nigel G.; Arnaboldi, Magda; Kuijken, Konrad; Merrifield, Michael R.; Napolitano, Nicola R.; Capaccioli, Massimo; Freeman, Kenneth C. (19 September 2003). "A Dearth of Dark Matter in Ordinary Elliptical Galaxies". Science. 301 (5640): 1696–1698. arXiv:astro-ph/0308518. Bibcode:2003Sci...301.1696R. doi:10.1126/science.1087441. PMID 12947033. ^ Matthews, Thomas A.; Sandage, Allan R. (July 1963). "Optical Identification of 3c 48, 3c 196, and 3c 286 with Stellar Objects". The Astrophysical Journal. 138: 30. Bibcode:1963ApJ...138...30M. doi:10.1086/147615. ^ a b Wallace, P.R. (1991). Physics : imagination and reality. Singapore: World Scientific. pp. 235–246. ISBN 997150930X. ^ Chiu, Hong-Yee (1964). "GRAVITATIONAL COLLAPSE". Physics Today. 17 (5): 21. Bibcode:1964PhT....17e..21C. doi:10.1063/1.3051610. ^ Rubin, Vera C.; Graham, J. A.; Kenney, Jeffrey D. P. (July 1992). "Cospatial counterrotating stellar disks in the Virgo E7/S0 galaxy NGC 4550". The Astrophysical Journal. 394: L9. Bibcode:1992ApJ...394L...9R. doi:10.1086/186460. ^ Kudritzki, R.-P. (May 2010). "Dissecting galaxies with quantitative spectroscopy of the brightest stars in the Universe". Astronomische Nachrichten. 331 (5): 459–473. arXiv:1002.5039. Bibcode:2010AN....331..459K. doi:10.1002/asna.200911342. ^ a b c d Kitchin, C.R. (1987). Stars, nebulae, and the interstellar medium : observational physics and astrophysics. Bristol: A. Hilger. pp. 265–277. ISBN 0-85274-580-X. ^ Huggins, Sir William (1899). The Scientific Papers of Sir William Huggins. London: William Wesley and Son. pp. 114–115. ^ a b c Tennyson, Jonathan (2005). Astronomical spectroscopy : an introduction to the atomic and molecular physics of astronomical spectra ([Online-Ausg.]. ed.). London: Imperial College Press. pp. 46–47, 99–100. ISBN 1-86094-513-9. ^ Hirsh, Richard F (June 1979). "The Riddle of the Gaseous Nebulae". Isis. 70 (2): 162–212. Bibcode:1979Isis...70..197H. doi:10.1086/352195. JSTOR 230787. ^ Bowen, I. S. (1 October 1927). "The Origin of the Nebulium Spectrum". Nature. 120 (3022): 473–473. Bibcode:1927Natur.120..473B. doi:10.1038/120473a0. ^ Efremov, Yu. N. (22 February 2011). "On the spiral structure of the Milky Way Galaxy". Astronomy Reports. 55 (2): 108–122. arXiv:1011.4576. Bibcode:2011ARep...55..108E. doi:10.1134/S1063772911020016. ^ Shu, Frank H. (1982). The physical universe : an introduction to astronomy (12. [Dr.]. ed.). Sausalito, Calif.: Univ. Science Books. pp. 232–234. ISBN 0-935702-05-9. ^ Hudson, Reggie L. "The Interstellar Medium". Goddard Space Flight Center Astrochemistry Laboratory. Archived from the original on 13 July 2013. Retrieved 19 November 2013. ^ a b Cami, J.; Bernard-Salas, J.; Peeters, E.; Malek, S. E. (22 July 2010). "Detection of C60 and C70 in a Young Planetary Nebula". Science. 329 (5996): 1180–1182. Bibcode:2010Sci...329.1180C. doi:10.1126/science.1192035. PMID 20651118. ^ Millar, TJ; DA Williams (1993). Dust and chemistry in astronomy. Bristol [u.a. ]: Inst. of Physics. p. 116. ISBN 0-7503-0271-2. ^ Johansson, LE; Andersson, C; Ellder, J; Friberg, P; Hjalmarson, A; Hoglund, B; Irvine, WM; Olofsson, H; Rydbeck, G (1984). "Spectral scan of Orion A and IRC+10216 from 72 to 91 GHz". Astronomy and Astrophysics. 130: 227–56. Bibcode:1984A&A...130..227J. PMID 11541988. ^ "Hubble Pinpoints Furthest Protocluster of Galaxies Ever Seen". ESA/Hubble Press Release. Retrieved 13 January 2012. ^ Haynes, Martha. "Hubble's Law". Cornell University. Retrieved 26 November 2013. ^ Huchra, John. "Extragalactic Redshifts". California Institute of Technology. Retrieved 26 November 2013. ^ Ellis, Richard S.; McLure, Ross J.; Dunlop, James S.; Robertson, Brant E.; Ono, Yoshiaki; Schenker, Matthew A.; Koekemoer, Anton; Bowler, Rebecca A. A.; Ouchi, Masami; Rogers, Alexander B.; Curtis-Lake, Emma; Schneider, Evan; Charlot, Stephane; Stark, Daniel P.; Furlanetto, Steven R.; Cirasuolo, Michele (20 January 2013). "THE ABUNDANCE OF STAR-FORMING GALAXIES IN THE REDSHIFT RANGE 8.5-12: NEW RESULTS FROM THE 2012 HUBBLE ULTRA DEEP FIELD CAMPAIGN". The Astrophysical Journal. 763 (1): L7. arXiv:1211.6804. Bibcode:2013ApJ...763L...7E. doi:10.1088/2041-8205/763/1/L7. ^ "Hubble census finds galaxies at redshifts 9 to 12". NASA/ESA. Retrieved 26 November 2013. ^ "Planck reveals an almost perfect universe". ESA. 21 March 2013. Retrieved 26 November 2013. ^ "Peculiar Velocity". Swinburne University of Technology. Retrieved 26 November 2013. ^ Yasuda, Naoki; Fukugita, Masataka; Okamura, Sadanori (February 1997). "Study of the Virgo Cluster Using the B‐Band Tully‐Fisher Relation". The Astrophysical Journal Supplement Series. 108 (2): 417–448. Bibcode:1997ApJS..108..417Y. doi:10.1086/312960. ^ a b "Types of Binary Stars". Australia Telescope Outreach and Education. Australia Telescope National Facility. Retrieved 26 November 2013. ^ a b Gray, Richard O.; Christopher J. Corbally (2009). Stellar spectral classification. Princeton, N.J.: Princeton University Press. pp. 507–513. ISBN 978-0-691-12510-7. ^ Goody, Richard M.; Yung, Yuk Ling (1989). Atmospheric Radiation: Theoretical Basis. New York, New York, USA: Oxford University Press. ISBN 0-19-505134-3. ^ Tessenyi, M.; Tinetti, G.; Savini, G.; Pascale, E. (November 2013). "Molecular detectability in exoplanetary emission spectra". Icarus. 226 (2): 1654–1672. arXiv:1308.4986. Bibcode:2013Icar..226.1654T. doi:10.1016/j.icarus.2013.08.022. ^ Bus, S (July 2002). "Phase II of the Small Main-Belt Asteroid Spectroscopic Survey A Feature-Based Taxonomy". Icarus. 158 (1): 146–177. Bibcode:2002Icar..158..146B. doi:10.1006/icar.2002.6856. ^ Chapman, Clark R.; Morrison, David; Zellner, Ben (May 1975). "Surface properties of asteroids: A synthesis of polarimetry, radiometry, and spectrophotometry". Icarus. 25 (1): 104–130. Bibcode:1975Icar...25..104C. doi:10.1016/0019-1035(75)90191-8. ^ Sekanina, Zdenek; Kracht, Rainer (3 Jun 2015). "Disintegration of Comet C/2012 S1 (ISON) Shortly Before Perihelion: Evidence From Independent Data Sets". arXiv:1404.5968v6 [astro-ph.EP]. ^ Knight, Matthew. "Why does ISON look green?". Comet ISON Observing Campaign. Retrieved 26 November 2013. ^ Lisse, C. M.; Dennerl, K.; Englhauser, J.; Harden, M.; Marshall, F. E.; Mumma, M. J.; Petre, R.; Pye, J. P.; Ricketts, M. J.; Schmitt, J.; Trumper, J.; West, R. G. (11 October 1996). "Discovery of X-ray and Extreme Ultraviolet Emission from Comet C/Hyakutake 1996 B2". Science. 274 (5285): 205–209. Bibcode:1996Sci...274..205L. doi:10.1126/science.274.5285.205. Wikimedia Commons has media related to Astronomical spectroscopy.